Scotch Brite Sanding Linishing Belts. Designed for finishing and polishing all metal and steel. All sizes available in fine, medium and coarse. These belts are excellent for polishing, conditioning and finishing. They are designed to remove surface imperfections, grindlines, mill, and other marks from industrial materials. 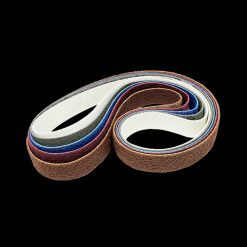 Browse our selection of Scotch Brite linishing belts below, or visit our shop page to browse our selection of Zirconia Sanding Belts.